The son of 2 champions, Zegna had an illustrious show career in Australia from 2004 to 2006. 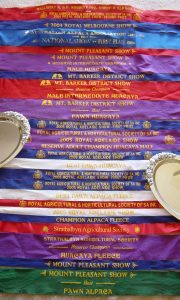 Zegna excelled in breed classes, but his most impressive result was Supreme Huacaya Fleece at the Royal Adelaid show in 2005. He spent only one year at stud in Australia before being imported into New Zealand – but more than a decade later his Australian breeders were still singing his praises – and we jumped at the chance to include him in our herd, even as a teenager. Zegna is a dark fawn, masculine macho, with a lustrous, dense, crimpy fleece. At 12 years he was still only 25 micron, and sd of only 3.9 – almost unheard of for a sire of this age. You’ll be delighted at the benefits of adding Zegna genetics to your herd. although at this stage, he is not available at public stud, we will have a small number of females carrying his cria available for sale, and in time, his cria too. Zegna’s sire, Jolimont Conquistador, achieved fame in Australia both in the show ring, and for his incredibly dense fleece. 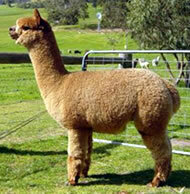 Lesser known, but still impressive was Zegnas maternal grandsire, Peruvian Primero. This is a solid genetic background that fulfils our requirement for an impressive pedigree in addition to appearance and fleece qualities, and now available for you to use to upgrade your own herd.